It can be hard finding an activity gym for your little one that is convenient, easy to assemble, easy to travel with, and affordable! 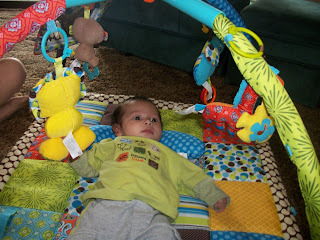 I received an Infantino Twist and Fold Gym to review being an Infantio Test Drive Mom, and I think this is a great baby gym! 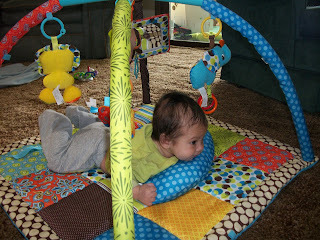 I wish I would have had this play gym for my oldest when I first became a new mom. This is one of the easiest play mats for setting up, and folding it to put away/travel with. When setting up the Infantino Twist & Fold, you lay the mat on the floor, push down on the top down, twist and lock into place. 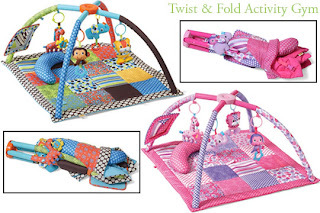 When putting the Twist & Fold away, just unlock the top and twist, the mat will be easy to fold together for storage. 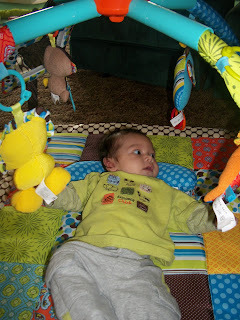 The colors are vibrant, there are rattles, musical animals, and an attachable mirror for baby to view in. There are four animals that hang from the arches. One animal plays music, one is a rattle, and two of them have a few attachments (like rings). I like that the Infantino's Twist and Fold gym offers two locations for you to attach the toys. You can place the toys lower (near the base) for the baby who is younger, and not reaching for toys quite yet, or you can place the toys higher up the arch if they are reaching for or hitting toys. I think the movable pillow is great! I like that the pillow isn't positioned to just one spot on the mat. 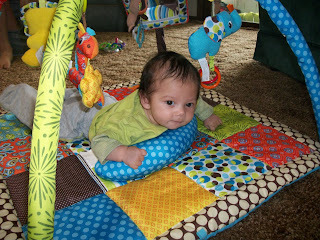 Parents, or babies can place the pillow wherever on the mat that they want to. 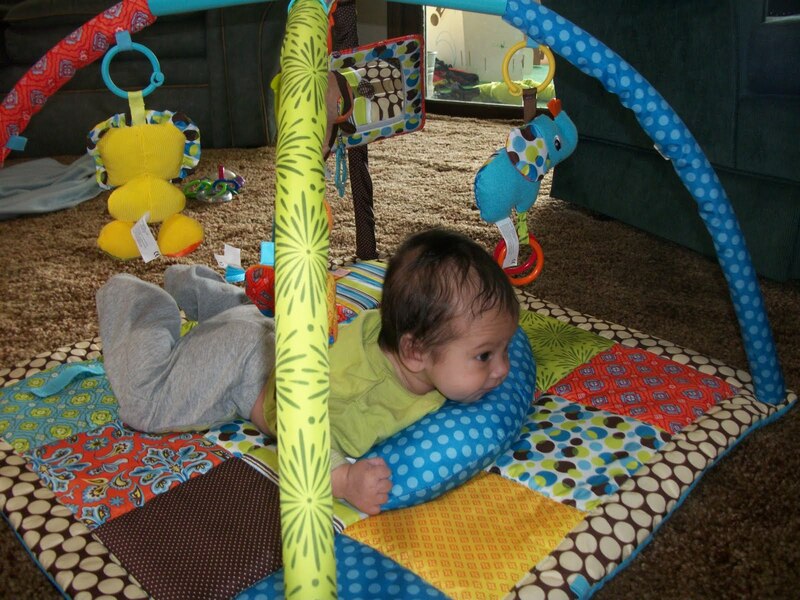 Plus, there isn't any Velcro or attachments to the pillow, which can lesson the comfort while baby lays on it. Infantino, headquartered in San Diego, Calif. is a leading designer and international distributor of innovative and original infant, toddler, and preschool products. Featuring fashion-forward designs, the popular product lines include classic creative baby toys and puzzles, innovative soft baby carriers, and simple, no-fuss baby travel systems.